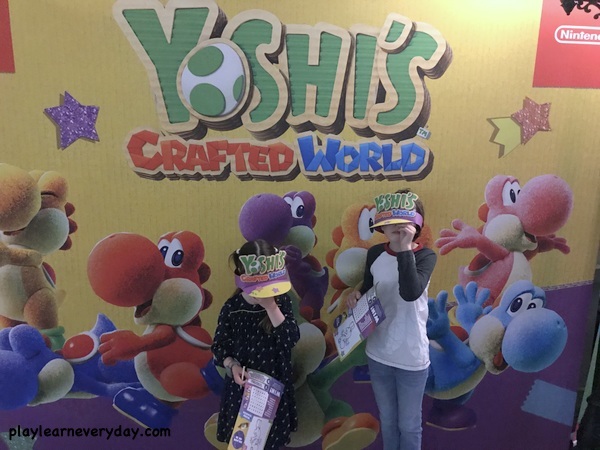 We are always looking for fun days out over the school holidays, especially Easter break as it can be so long and the weather isn't always fantastic, so when we were invited by Nintendo to visit Kidzania and try out Yoshi's Easter Egg Hunt of course we jumped at the chance! 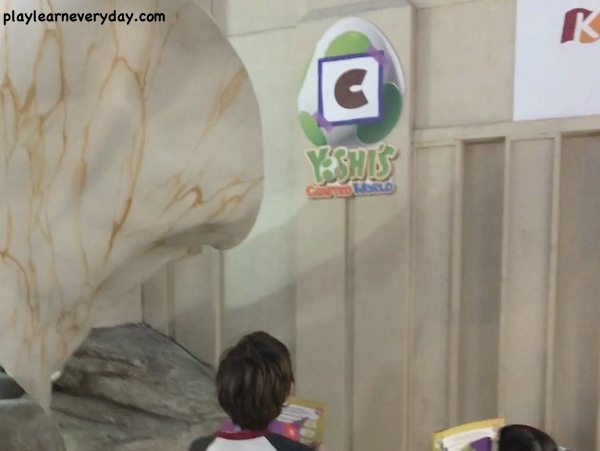 Yoshi's Easter Egg Hunt is running at Kidzania London from now until April 21st. It is included in your regular ticket to Kidzania (it's always advisable to book tickets in advance) and can be done as one of your activities at any time of your visit. 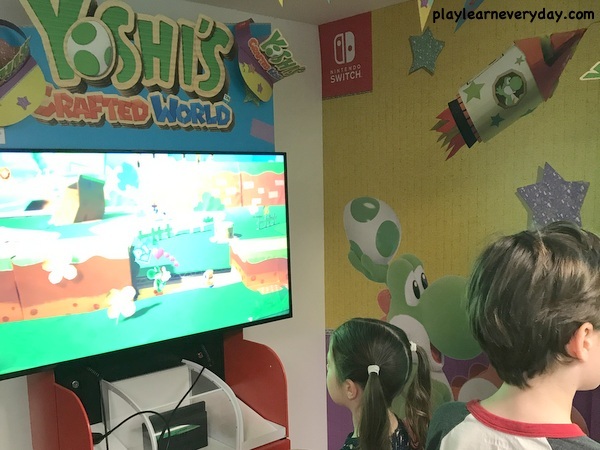 We arrived at the Yoshi's Easter Egg Hunt area and and had our wristbands scanned, the children then had a few minutes to play the new Yoshi's Crafted World game on the Nintendo Switch. The absolutely loved it straight away! Ivy thinks that Yoshi is adorable and was happily just walking him around and exploring the game as she went along. Ethan was drawn in by the features, when one of the staff members showed him how to throw an egg at a wall to make it come down into a bridge he was fascinated! This is definitely a game that they would like to explore more. 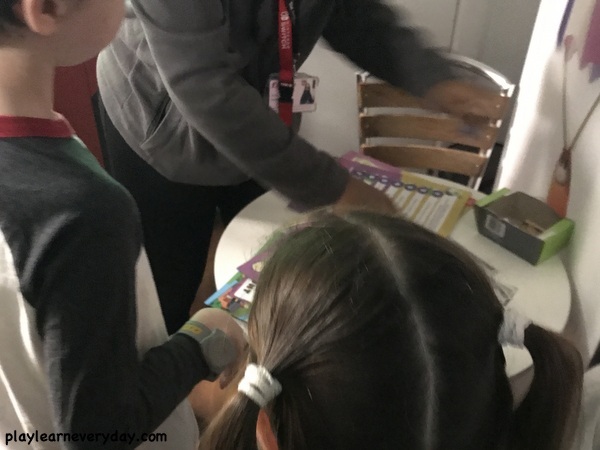 After a little bit of time to play Yoshi's Crafted World all of the children in the room were then brought together where the staff explained how the Yoshi's Easter Egg Hunt would work and handed each child a pencil and booklet with some activities and the clues to find the hidden eggs around Kidzania. We made our way out and first took a photo in front of the Yoshi's Crafted World backdrop. 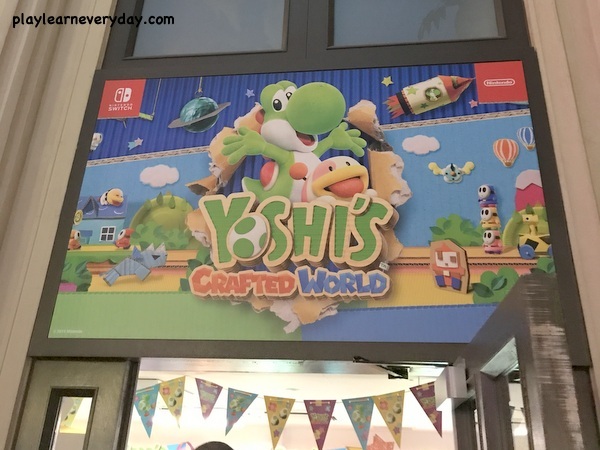 If you take a photo there and upload it to social media using #YoshisCraftedWorld and #Kidzania you will be entered into a competition to win a Nintendo Switch, the Yoshi's Crafted World game, a one year membership to Nintendo online and family passes to Kidzania. Then we set off around Kidzania, following the clues to find all seven eggs hidden throughout. It took us a little while to get the hang of it, but soon we were whizzing around filling in all of those blanks with the letters. Once you've found all of the letters you then unscramble them to discover the mystery word and write it on the bottom of your sheet. You then bring your completed sheet back to the Yoshi's Easter Egg Hunt activity where you will be rewarded with a certificate and 10 Kidzos! 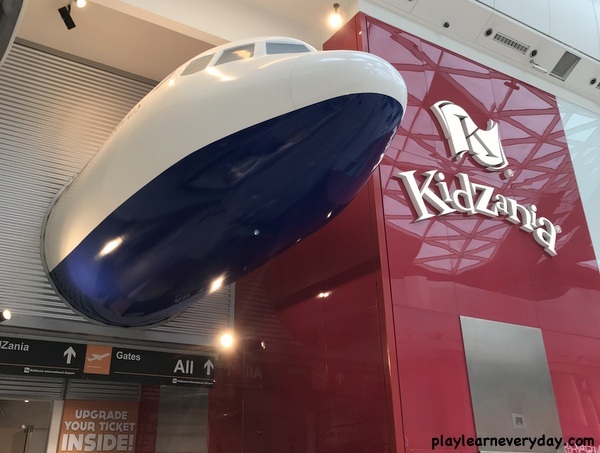 We then explored the rest of Kidzania and absolutely loved it (we will definitely be writing more about the whole experience!) 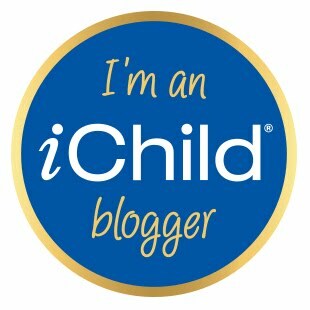 There were just so many activities to do and it was incredible to watch the children as they did these activities on their own (grown ups have to wait outside each activity and watch) and as they grew in confidence and independence. 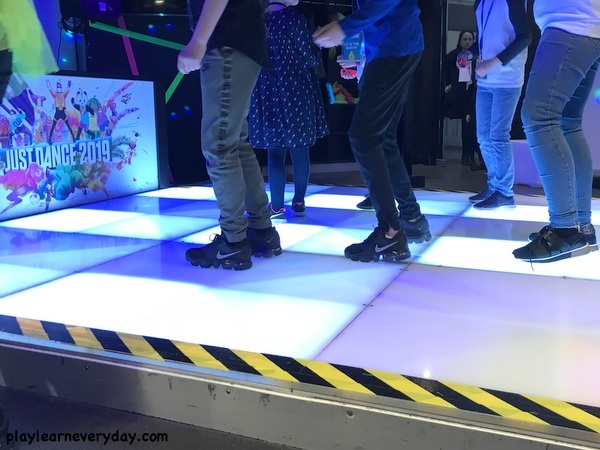 Ivy's favourite activity of the day was the Just Dance Dance Club, where they children get to follow along with the moves up on the screen to train to be dance teachers. It is another Nintendo Switch game so they are holding the controllers which registers their dance moves, and the winner of the game earns extra Kidzos. Ethan's favourite activity of the day was the Nintendo Labo Workshop where he got to make his own remote controlled car out of cardboard which he could then control with a Nintendo Switch. 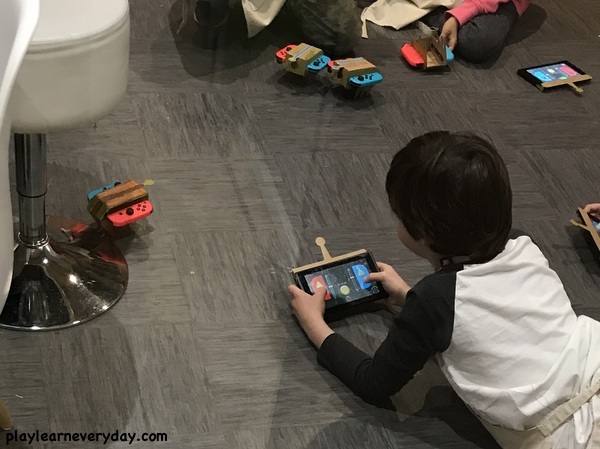 They then move on to the discover station where they get to see more of what the Nintendo Labo can do, by trying out a robot, a fishing game and even a piano made out of cardboard. At the end of this activity they get to take home their cardboard car as well as a special certificate.